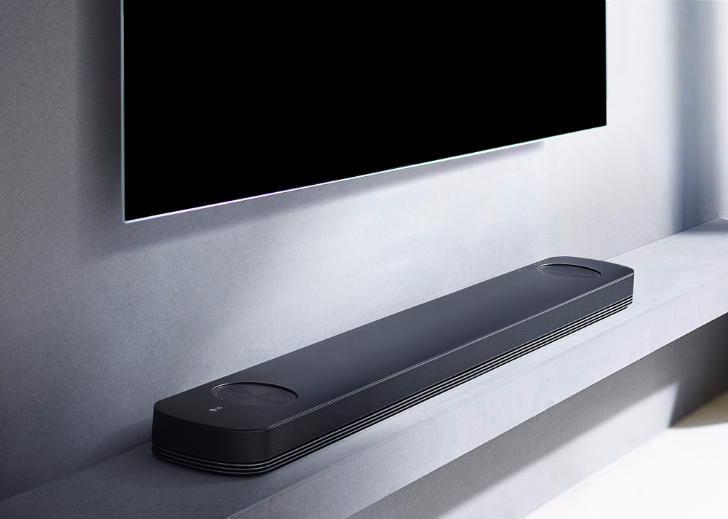 One is the SJ9, pictured above, the first Dolby Atmos soundbar for a cinema-like audio experience and 3D rendering of objects and sounds in space. This is accomplished thanks to multiple front-facing speakers and two up firing ones that try to envelop the room as much as possible with sound. The second is the SJ8, pictured below, which doesn't have Dolby Atmos but does come with a slim 38mm profile and a "TV Perfect Fit Kit" that lets you replace the TV stand from any LG 2017 model with the soundbar, for a more streamlined look. Both soundbars have high-resolution audio, which LG is calling 4K audio (because 24bit x 96kHz x 2ch = 4,000kbps and that makes sense somehow...), high quality lossless audio files (no detailed specs yet), upsampling of low bitrate files to 24-bit/192kHz, 4K pass-through to get picture and sound from Ultra HD Blu-Ray players, and yes, Chromecast built-in. There are no specifics there, but given the release date, the "Chromecast" and not "Google Cast" name, it should have grouping and multi-room support to work with Google Home and other Chromecasts.